Alcoa mechanical engineer Paula West and baby daughter Karla with the iWomen girls at Alcoa Discovery Centre, Pinjarra. IT was not a typical school day for a group of female year 10 students – but it was a typical day in the work life of a woman in mining at Alcoa. 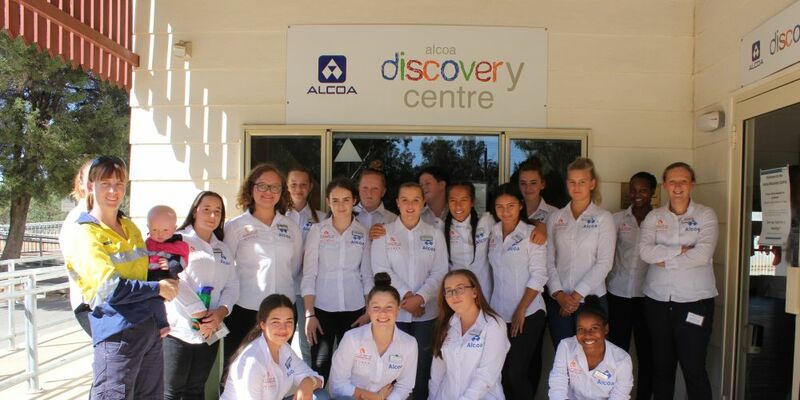 More than 30 girls from high schools across Rockingham, Kwinana and Cockburn toured Alcoa’s Huntley Mine and Pinjarra Alumina Refinery as part of the Kwinana Industries Council 2018 iWomen Project to explore the broad range of career options available in the resources sector. An industry tour is a highlight of the six-day iWomen Project and this year Alcoa hosted the girls, challenging their thinking about women in mining with a day at Huntley bauxite mine where they climbed a haul pack truck and viewed mining production and rehabilitation. The iWomen also toured Pinjarra refinery and visited the Alcoa Discovery Centre in Pinjarra where mechanical engineer Paula West and her baby daughter Karla, urged the girls to join the resources sector as Alcoa’s parental leave and work flexibility provided great support in progressing her career while raising two children.